Storero Fabbrica Automobili was a car producer from Turin italy. It was founded by ex. Fiat racing driver and motoring pioneer of Italy, Luigi Storero in 1912. The company built four and six cylinder models until 1919. In 1904 Luigi Storero, one of the first Italian riders racing aboard a Fiat 10.5 PS participated in the famous race-Gordon Bennett of Germany. Luigi Storero, had also been manufacturer of bicycles and tricycles with motor, which had concerned himself Giovanni Agnelli (Fiat founder). In 1905, he founded in Turin the "Società garage Ruiniti Fiat-Alberti-Storero", a subsidiary of the Fiat Group, initially as a company dedicated to the maintenance service of Fiat cars. 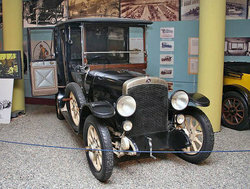 In 1908, Fiat took control of the firm and four years later in 1912, and also in Turin, Storero created by his account of the "Fabbrica Storero Automobilia." The first car brand Storero was a 20/30 hp motor with monobloc 4-cylinder and 4398 cc, with side valves. Later came a 15/20 hp motor with 4-cylinder 3308 cc. 20/30 hp derived from the version of competition B20/30 of 3.7 liters. With the start of the war, production was concentrated in the manufacturing of military equipment, and by the end of hostilities in 1919 the firm ceased.